You’ll probably be glad to learn there will be no newsletter for the next two weeks, until Sept. 23. 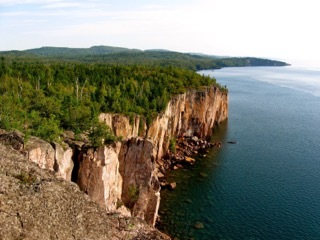 We’re heading for the North Shore of Lake Superior to enjoy majestic views (see above photo), hike some trails, and get rejuvenated. A preponderance of negative news can place a great strain on one’s psyche, and since many of the online articles I read in preparing this newsletter contain unpleasant news, a hiatus is very welcome. I’m sure you’ll agree that periodic breaks from normal routines can help calm fears, restore wellness, clarify perspectives, and focus one’s energies on things that truly matter. Nature’s nurturing powers are well proven. Most readers of this newsletter have experienced first-hand the positive effects of spending time soaking in the exquisite grandeur, power, and diversity of nature. Sadly, many people, especially younger generations, have not spent much time outdoors, much less in wilderness areas. For example, because a great majority of families visiting national parks are in a rush to cover many attractions, they mostly traverse the popular short paths leading to major sites. We’ve observed this tendency when hiking popular trails, such as the Jenny Lake Trail in Teton National Park, Wyoming. Most people, after taking a shuttle boat across the lake, might make it to Hidden Falls, or up to Inspiration Point, a 400-foot high trek. But along the Cascade Canyon Trail that continues on from the lookout point, fewer people are encountered the farther one goes. The last time we hiked the trail (in 2011), a 9-mile round trip, we encountered fewer and fewer hikers the farther we went. All the while we were treated to spectacular wilderness scenery, including a few moose lumbering about on the other side of the stream that flows through the canyon’s narrow valley. For more adventurous backpackers, wilderness areas offer exciting and challenging explorations. Although we camped a lot in our early adult years, we’ve grown softer as we’ve aged. Backpacking is one experience we’ve missed, but it’s too late now. These days we’re set on finding comfortable lodging, and taking day hikes. Locally, young people who embark on group trips into the Boundary Waters Canoe area of northern Minnesota participate in an educational wilderness adventure, including learning how to deal with insects (mosquitoes, ticks), variable weather, and strenuous activities. For city kids, it’s a mind opening, physically demanding experience to actually be outdoors for several days, minus electronic distractions. If you have children, consider ways to help them experience the outdoors. The BWCA experience is highly recommended! Two of our grandkids took group BWCA expeditions this summer, one for the second time. > Eco Watch: 10 Reasons Why You Feel So Good in Nature (Kris Abrams). If you spend time in nature, you’ve probably noticed that you feel happier out there than in here. One of the better-known theories, the “biophilia hypothesis,” suggests that we love nature because we evolved in it. We need it for our psychological wellbeing because it’s in our DNA. This theory rings true to me. But it’s so broad, it also leaves me grasping for more. What is it about nature and our relationship to it that brings us so much joy? > Resilience: Back To The Future For Work (Andrew Curry). Most discussion of the future of work assumes that the work, or the lack of it, is our coming problem. But what if we’ve got the question the wrong way around? What if we’re slowly, or not so slowly, giving up on the idea of work? After all, we all know that most work is dull. And even the interesting stuff is exploitative, somewhere along the line. > Ensia: It’s Time For The Health Care Industry To Raise Its Voice On Climate Change (Leo Raudys). The main reason the health care industry should look to act more boldly on issues stemming from climate change is because of its ultimate mission to make the world a healthier place. The [tech] industry is now forging ahead with some of the most aggressive actions we’ve seen on climate from the business community. > Our Finite World: Deflationary Collapse Ahead? (Gail Tverberg). Slow economic growth is what brings the persistent trend toward low commodity prices experienced in recent years. If we are indeed facing the downturn forecast by Limits to Growth modeling, we are facing a predicament that doesn’t have a real solution. We can make the best of what we have today, and we can try to strengthen bonds with family and friends. We can try to diversify our financial resources, so if one bank encounters problems early on, it won’t be a huge problem. We can perhaps keep a little food and water on hand, to tide us over a temporary shortage. We can study our religious beliefs for guidance. > Peak Prosperity: Here’s Why The Markets Have Suddenly Become So Turbulent (Charles Hugh Smith). Trying to finger the proximate cause of the mini-crash is an interesting parlor game, but does it really help us identify the trends that will shape markets going forward? We might do better to look for trends that will eventually drag markets up or down, regardless of HFT, currency revaluations, etc. For example, the entire China narrative is over, as is the emerging market story. There are diminishing returns of additional debt that has fueled economic growth, and there are limits on deficit-spending fiscal stimuli. Also, as social policy, central bank stimulus (QE) has been discredited, and the 2008-09 fixes are no longer available. What ultimately matters are capital flows. > Resource Insights: Anxiety Turns To Fear: Markets, Energy, Pan And The Zeitgeist (Kurt Cobb). The characteristic feeling of the post-2008 world has been one of anxiety. Occasionally, that anxiety breaks out into fear as it did in the last two weeks when stock markets around the world swooned and middle class and wealthy investors had a sudden visitation from Pan, the god from whose name we get the word “panic.” Pan’s appearance is yet another reminder that the relative stability of the globe from the end of World War II right up until 2008 is over. We are in uncharted waters. > Climate Central: White House: Efficiency Key To Tackling Climate Change (Bobby Magill). As a way to help homeowners act on climate change locally, the White House on Monday announced a series of clean energy policies meant to increase the energy efficiency of homes and make rooftop solar installations accessible without a huge outlay of money. The Obama administration, as part of its Clean Power Plan, has highlighted energy efficiency as one of the ways states can reduce their reliance on high carbon-emitting sources of electricity. > E&E Publishing: President Obama Launches An 11-Day ‘ Climate Tour’ To Broaden Clean Energy Use (Brittany Patterson). Speaking at the eighth annual National Clean Energy Summit, hosted by Senate Minority Leader Harry Reid (D-Nev.), Obama touted clean, renewable energy as a way to not only cut emissions that contribute to climate change but also create jobs and grow the economy. For Congress and other naysayers, the president had little patience. The president’s remarks came after the administration earlier yesterday pledged money toward a slew of programs aimed at expanding everyday Americans’ access to renewable energy technologies (Greenwire, Aug. 24). > Resilience: Bee Battles: Why Our Native Pollinators Are Losing The War (Kelsey K. Graham). After direct habitat loss, invasive species are the second greatest threat to biodiversity. Biodiversity is crucial to a healthy ecosystem, providing us services such as food, the natural resources that sustain our current lifestyle, and the building blocks of medicines. Invasive species come in all forms – plants, animals and microbes – but all share common traits: they are non-native, they are increasing in prevalence, and they negatively affect native species. > On Earth: These Are All The Wildfires Burning Through The Country Right Now (Clara Chaisson). This has been a record-breaking wildfire season in the United States and Canada—the news broke as about 70 firefighters from Australia and New Zealand landed in Boise, Idaho, to lend international aid to the smoldering West. Earlier this month, the U.S. Forest Service estimated it would spend more than half of its 2015 budget on fighting wildfires. In fact, the country is getting used to going into red in regard to its blaze-fighting budgets. > LA Times: The Human ‘Superpredator’ Is Unique — And Unsustainable (Amina Khan). A new study that examined 2,125 interactions between predators and their prey found that humans kill other carnivores at a rate far higher than all other top predators. But what solidifies our No. 1 position is the fact that our hunting methods are so devastating to other species that they alter the course of their evolution — if they’re not driven to extinction. > Scientific American: Rising Sea Levels More Dangerous Than Thought (Tia Ghose, Live Science). The consequences of global sea level rise could be even scarier than the worst-case scenarios predicted by the dominant climate models, which don’t fully account for the fast breakup of ice sheets and glaciers, NASA scientists said on Aug. 26 at a press briefing. What’s more, sea level rise is already occurring. The open question, NASA scientists say, is just how quickly the seas will rise in the future. > Resilience: Small Town Resilience (Brian Miller). The small town is fundamentally more resilient because of its smallness and its proximity to productive land. Rural communities, with their face-to-face interactions, have provided the template for human existence for the past thousands of years. Megacity communities merely echo that type of lifestyle. They can nourish and sustain in the ascendancy, but their larger host survives only as wealth is pumped in from the outside world. When the pump is turned off, the decline is inevitable and rapid, a the fall of Rome illustrates, from a great city status to scattered villages. > Permaculture: Living With The Land Part 5 – No-Dig Gardening (9 How-To Videos: Charles and Steph Hafferty). No-dig gardening is a technique regularly used in permaculture. The use of a mulch on top of the soil mimics the leaves that drop from the trees, which then rot and are drawn into the soil by worms and microbes. In nature, soil is rarely disturbed, with all work being done by the bacteria and creatures in the soil. Charles explains the importance of soil, the beneficial bacteria and how soil disturbance reduces nutrients and affects the microbes good work. > Chicago Tribune: Be Generous: It’s A Simple Way To Stay Healthy (Terri Yablonsky Stat). Countless studies have found that generosity, both volunteering and charitable donations, benefits young and old physically and psychologically. The benefits of giving are significant, according to those studies: lower blood pressure, lower risk of dementia, less anxiety and depression, reduced cardiovascular risk, and overall greater happiness. > NY Times: As Seas Rise, Saltwater Plants Offer Hope Farms Will Survive (Associated Press). On a sun-scorched wasteland near India’s southern tip, an unlikely garden filled with spiky shrubs and spindly greens is growing, seemingly against all odds. The plants are living on saltwater, coping with drought and possibly offering viable farming alternatives for a future in which rising seas have inundated countless coastal farmlands. Sea rise, one of the consequences of climate change, now threatens millions of poor subsistence farmers across Asia. As ocean water swamps low-lying plots, experts say many could be forced to flee inland.